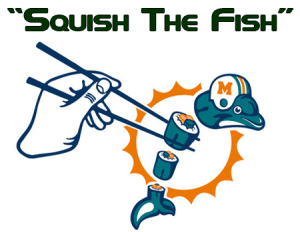 Squished Fish & Chips on the Jets Menu tomorrow at Peabody's! Squished Fish & Chips on the Jets Menu tomorrow at Peabody’s! Hey Jets fans… are you ready for some early morning football? While we’re enjoying some Bacon and Eggs, Gang Green will be feasting on Fish (and Chips) in London. It sure is going to feel weird watching football at 9:30am but it should also be a lot of fun sharing breakfast with my Jets family. As most of you know, the management at Peabody’s are opening up the doors at 8:30am just for us and are serving breakfast all morning. The regular menu will not be available until sometime after 11am. There will also be a special breakfast drink available so come thirsty and hungry. Although we are coming off a tough loss against the Eagles, we did have a great shot at tying the game at the end even without our top running back and number 2 and 3 receivers. We played tight that second half and stayed in it right to the end. Look, no one expected us to win every game, right? But this week…this week is special. Not only are we playing a spotlight game in London but we play our oldest rival for the 100th time. This is a game we should win and I do think we will win in a big way with some of our starters coming back. I also love seeing all the pics and videos that are plastered all over Facebook of all the fans their to support the team. Looks like the deck will be stacked and the stands will be packed for the NYJ! But let’s face it, not everyone could make it out to London to be with the team. That would have been nice, right? However, you can certainly make it out to Peabody’s to show your support and have a good time. Yes you can watch it at home but nothing matches the excitement of watching the game with your Jets family (unless you have tickets to the game). With the bye week next week, Sunday’s game is your last opportunity for a couple of weeks to join us and it’s likely to be the only 9:30am game we share together for a long, long time. The time may be different but lots of things will stay the same. I’ve got a whole bunch of new stuff for the 50/50 raffle and some goodies for the kids so be sure to bring out the whole family to our one of a kind Squish the Fish Breakfast Bowl. My given name may be Steve but my friends have been calling me Festa for the last 30 years. While I really miss going to all the JETS home games and tailgating with a large group of friends, it’s really great being here in Tampa around other JETS fans while we root for our team. When I founded the fan club in October of 2004 I never imagined it would become as massive as it now has with over 600 members from around the world and sister Fan Club Chapters in 4 other Florida cities and growing.